This folder has three articles focusing on the fortunes of Indianapolis automobile companies in the summer of 1910. One article talks about Marmon as well as Moon Motor Company plans to enter the Elgin, Illinois road race. Another article reports on Marmon’s racing plans for the coming season in 1911. A third article focus on the Premier Automobile Company. This article discusses the entries for the Elgin, Illinois road races, the main event of which was the Elgin National Trophy. Ernie Moross wrapping up his stint as director of contests at the Indianapolis Motor Speedway when he wrote this article which was published July 20, 1910. Moross opines on the progress of American automobiles in competition between 1900 and 1910. The legibility of this article is fair to poor. This article discusses the AAA contest board's decision to disqualify the Premier Manufacturing Company of Indianapolis from competing in events sanctioned by the auto club. The action was triggered by Premier's move to obtain a court injunction preventing the AAA from awarding the Chalmers Automobile Company their Glidden Trophy. Premier disputed the outcome of the Glidden Trophy touring car event for 1910. The article was printed July 29, 1910. This article, published July 18, 1910, reports on the Marmon Automobile Company's plans for racing in 1911. It mentions their top drivers Ray Harroun and Joe Dawson - who would go on to become the first and second winners of the Indianapolis 500 respectively. Harroun First at Churchill Downs! This article from the July 7, 1910 Indianapolis Star provides coverage of a race meet that took place at Churchill Downs (yes, the home of the Kentucky Derby) in 1910. This article describes plans of Indianapolis-based manufacturers to enter the classic road race at Elgin, Illinois for the 1910 edition of that event. 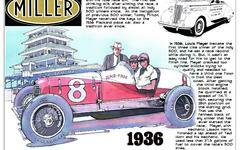 Premier, one of Indianapolis' top car manufacturers in the first decade of the 20th Century, got into a tussle with the AAA over their compliance to rules for Glidden Trophy reliability run in 1910. The Glidden reliability runs were conducted from 1905 through 1913 and were not auto races. The forerunner to road rallies, drivers were rewarded for staying on a schedule. Success meant the machine could arrive on time and in working order despite what were some pretty dreadful driving conditions.